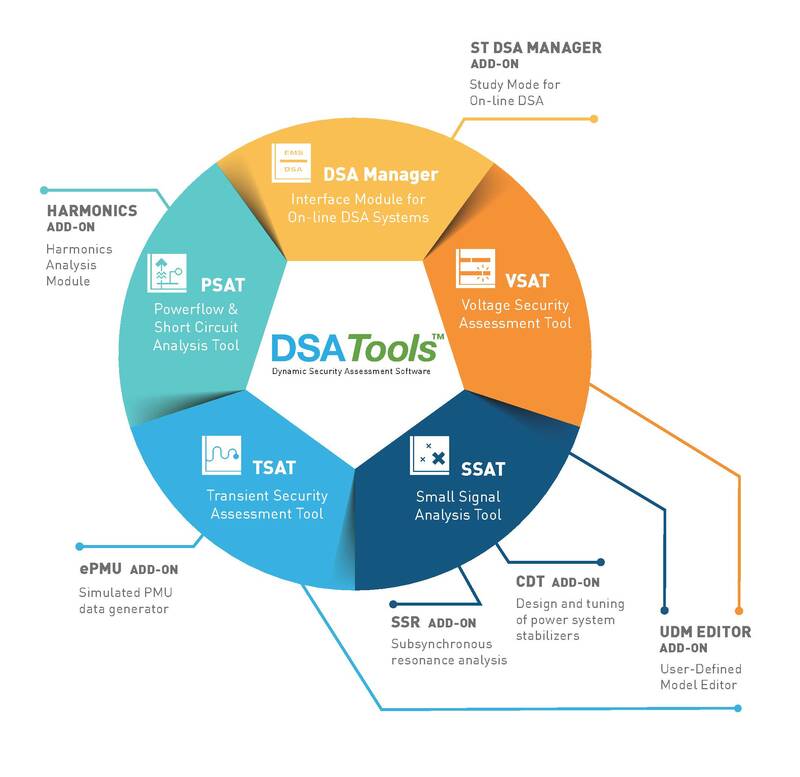 DSAToolsTM is a suite of leading-edge power system analysis tools that provides the capabilities for a complete assessment of system security, including all forms of stability. DSAToolsTM offers a complete toolset for power system planning and operational studies. In addition to rich modeling capabilities and advanced computational methods, the software is packed with useful study tools that enable significant productivity improvements. The key components in the suite – VSAT, TSAT, and SSAT – have also been designed to be used for on-line dynamic security assessment (DSA). In this mode, the software is connected directly to a power system’s energy management system (EMS) and assesses the system security in continuous cycles. An on-line DSA system provides system operators with important information about system security limits, critical contingencies, and remedial actions needed to prevent system failures. Please contact Powertech to obtain a license quotation. DSAToolsTM programs are coded with a Softkey protection scheme. Click here for more information. Training courses for DSATools™ are available from Powertech. Standard courses are regularly offered at Powertech’s office. Check here for the more information. Training can also be customized at a client’s request and delivered at a client’s site. Powertech provides technical support for DSATools™ with user support contracts. In addition, support services can also be provided to address special issues, such as extended support time with guaranteed service levels, model development and calibration, integration of on-line DSA system, etc.